Not everyone loves coffee — but it doesn’t have anything to do with caffeine, coffee’s biggest perk. The truth is, coffee can lead to jitters just as often as true productivity. That's not caffeine's fault, and other caffeine options offer wakefulness without the upset stomach, acid reflux and other digestive problems that coffee is known to make worse. In fact, there are more and more “clean caffeine” options on the market every day. If you’re trying to wean off of coffee, or just need a pick-me-up, black tea is an excellent choice as it has the highest caffeine content. Cyrille Bessiere recommends Chinese black tea, especially for in the morning. Top Picks: Bessiere’s pick is Palais des Thes’s Grand Yunnan Imperial, known as “the mocha of teas." For a more gentle lift any time of day, think green tea. Green tea contains L-theanine, a powerful amino acid with a significant (positive) effect on mental alertness. It’s known to help relax the mind without inducing drowsiness. L-theanine is a huge reason for the difference in the type of buzz we get from drinking tea vs. coffee (feeling alert but not jittery). Another powerful perk is EGCG, (epigallocatechin gallate), one of the most potent antioxidants in tea, found primarily in green and white teas. Studies show EGCG could prevent cancer and diseases, improve skin health, boost the immune system, and boost metabolism, Theresa Krier says. Top Picks: Palais des Thés’ signature Blend, Vive le Thé! is a green tea flavored with spicy ginger. Krier’s blend, Unexpected Fling, is mixed with rose and cherry. Green tea has about half the caffeine content of black tea. Numi’s Jasmine Green is a go-to, and widely available. Of all the tea types, white tea contains the most antioxidants and the least caffeine. 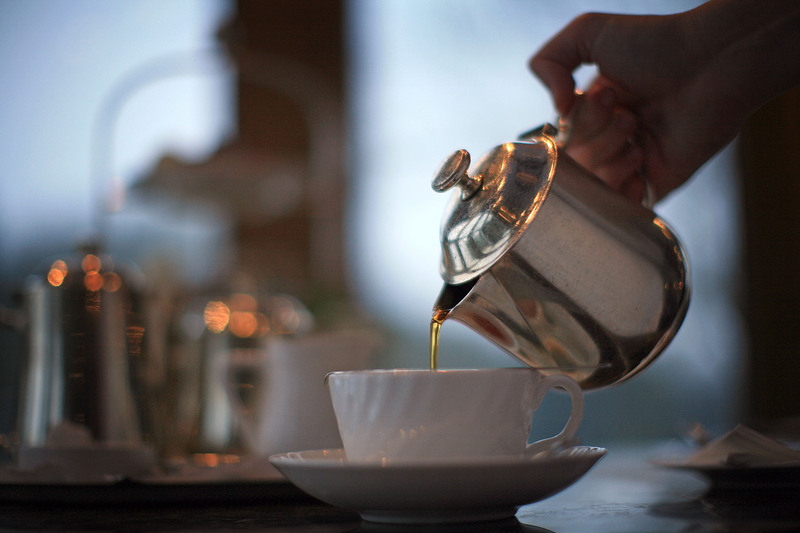 A cup of white tea has between 10-15 percent of the caffeine in a cup of coffee. Because it is the least processed, it usually has a delicate, light flavor. Top Picks: Numi’s White Rose is a favorite for its lovely, delicate flavor. Big T’s blend, Telltale Glow, includes goji berries, elderberries, and zante currants. “Pu-erh tea is an ancient healing tea picked from 500 year old organic, wild tea trees in the majestic mountains of China's Yunnan province,” Numi’s tea trainer, Joe McKinnon, says. “Pu-erh is processed differently from traditional white, green, and black teas, and goes through a unique fermenting process (which lasts around 60 days). The resulting taste is rich and smooth, with hints of malt; a fantastic alternative to coffee. Pu-erh has been purported to aid digestion and metabolism, maintain healthy cholesterol levels, help with weight management, and provide a boost of energy (without the jitters),” McKinnon says. Top Picks: Numi’s Cardamom Pu-erh is one to try out. Now, tea serves as the base for countless (refrigerated) beverages, many of which are widely available. Guayusa is getting more and more attention, as its reach expands beyond the Amazon as another clean caffeine alternative. I learned all about the natural tree from the passionate experts behind Runa. Guayusa is a naturally-caffeinated holly tree that grows in the Ecuadorian Amazon. It has been brewed like tea for thousands of years by indigenous tribes for its stimulative effects and health benefits. Guayusa is related to yerba mate but has a sweeter taste. Guayusa has about as much caffeine as coffee and contains even more antioxidants than green tea. These compounds neutralize free radicals and may help prevent premature aging. It also contains chlorogenic acids, which contribute to cardiovascular health, reduce high blood pressure, and regulate body weight. In addition, guayusa contains all 15 essential amino acids. Mate is a caffeine-rich drink made from the dried leaves of yerba mate plants. Nutrients include vitamins A, B1, B2, C, and E, phosphorus, iron, and calcium. Mate is not considered a tea since it does not come from the camellia sinensis plant, but it is also rich in polyphenol antioxidants.